The evening was a wonderful example of the community spirit which prevails at SPC as we welcome all new families to the College. 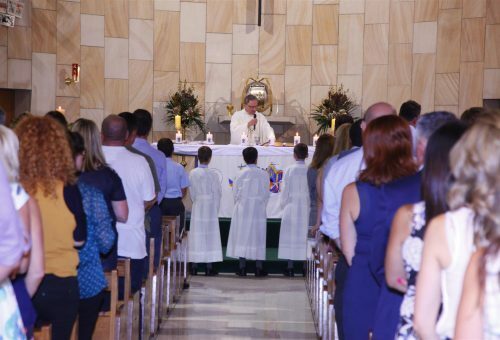 On Tuesday 21 February, Year 5 students and their parents were welcomed into the St Patrick’s College community during a special celebratory Mass. Father Jack Evans presided over another insightful liturgy. During the service, Year 5 class representatives took their class candles to be lit from the College candle by Year 12 Leaders. Members of the P&F Executive Committee were also introduced and inducted into the community. Miss Grapé lead over 180 boys whose melodious voices filled the Chapel. Special mention goes to Year 6 musicians: Bailey Yeates, Max van der Meer and Jack Power who did a wonderful job of accompanying the choir. The Mass culminated in a rousing rendition of the College Anthem which the boys all sang together for the first time. Following the celebration, everyone was invited to the College Hall for a well-earned supper which the P&F had generously prepared. The evening was a wonderful example of the community spirit which prevails at SPC as we welcome all new families to the College.